Admired for their impressive plumage, ring-necked pheasants inspire a devoted following of hunters, chefs, fly-tying anglers and artisans. The first thing to know about ring-necked pheasants is that they are flamboyantly beautiful birds. About the size of common chickens, ring-necks sport a dramatic array of feathers in various lengths, textures and colors, particularly the males. Long, tapered tails are striped brown, black and white, rumps can be bluish-green, flanks rippled yellow, and breasts a riot of mottled gold, copper, green, purple and rusty brown. Iridescent blue-green feathers hug the head, and a startling patch of red surrounds the eyes. The rings that earn them the name “ring-necked” are bold bands of green and white feathers encircling their necks like crisply starched collars. The eye-catching birds are fun to hunt as well, say hunters drawn to the challenge of shooting relatively small game known for mad dashes on foot and unpredictable moves in flight. They are delicious, too, according to those who cook them properly to retain wild flavors without letting the meat go dry or tough. Finally, the gorgeous feathers serve many purposes, as demonstrated by the anglers who use them to fashion tied flies, and the artisans who use them to create decorative objects and wearable art. For all their popularity today, pheasants are not native to North America. More than 35 species thrive in their native Asia, and many were imported centuries ago to Europe by wealthy nobles for sport hunting, but they’re relative newcomers here. The ring-necked, a close cousin to wild chickens, quails and partridges, is the pheasant most commonly found in the United States, thanks in part to one man on a mission. Owen Denny began importing them from China in 1881 and introducing them in Oregon’s Willamette Valley, intent on establishing a population for hunting. 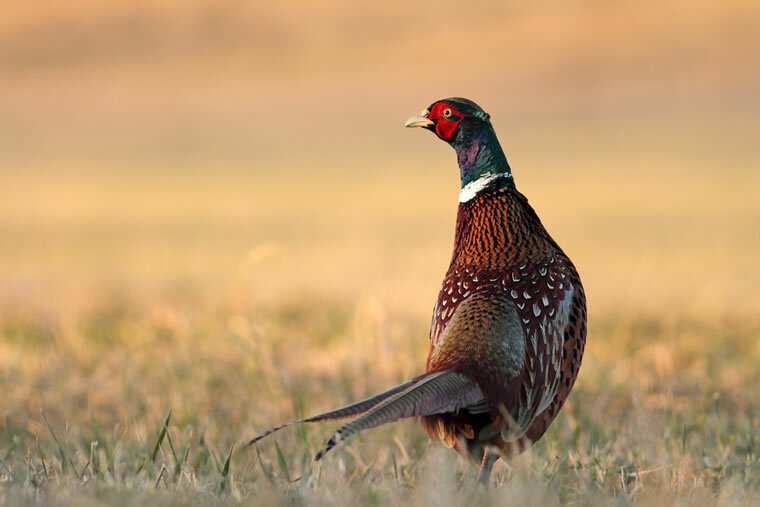 Pheasants don’t migrate, so they tend to stay in the general vicinity where released, and they are perfectly at home in forests, grasslands and swamps. By the late 1800s, flocks inhabited ever-larger sections of Oregon and Washington. Over subsequent decades, enthusiasts, including individual hunters, hunting clubs, farmers and government agencies, introduced pheasants throughout the Pacific Northwest, across the upper Great Plains and into the Midwest. So many pheasants live in South Dakota that the ring-necked was named the state bird in 1943. Its in-flight image was featured on the state’s U.S. Mint-issued quarter in 2006. Pheasant hunting eventually spread to New England and Southern states, although wild populations haven’t taken hold there. Instead, hunting clubs release captive-raised birds specifically for arranged shoots. 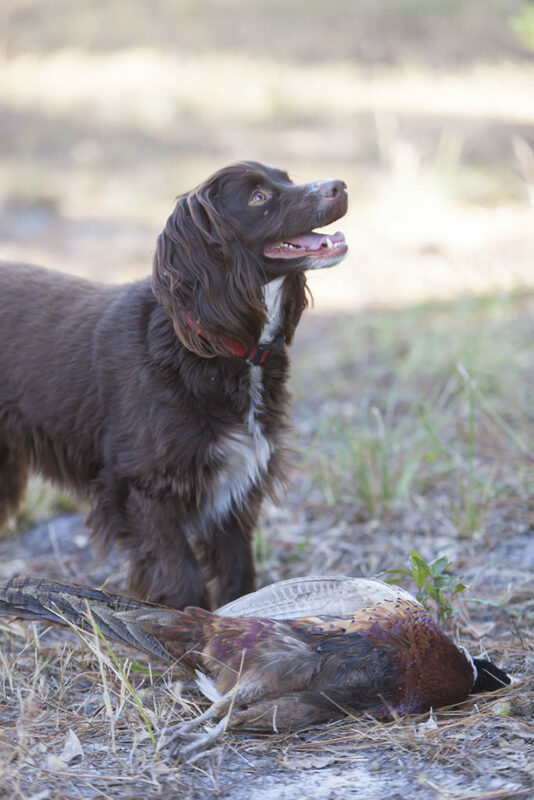 Pheasant hunts are offered at Broadfield, A Sea Island Sporting Club and Lodge, from October through March. Ring-necked pheasant hunting reached the Southeast in the late 1920s, nurtured by the owners of private preserves and hunting clubs. In Georgia, that included the founders of Sea Island, who in 1928 built The Cloister. 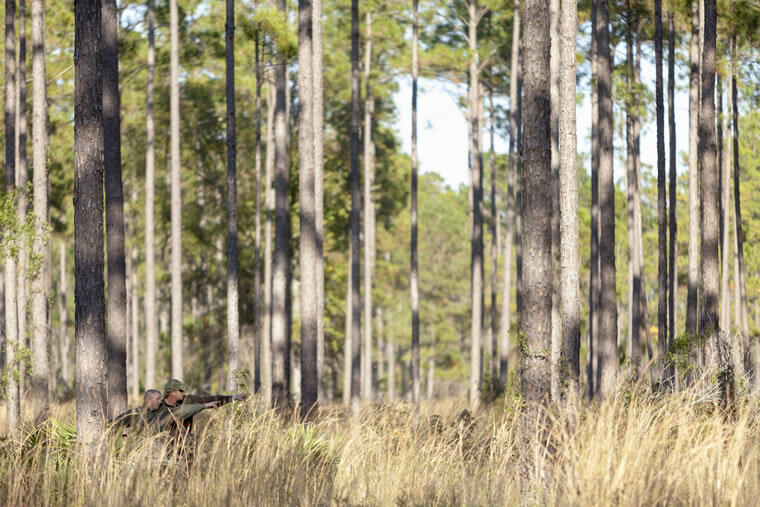 One year later, the first pheasant hunts took place, involving a few special guests trekking to nearby Sapelo Island for an arranged shoot. Pheasant hunting at Broadfield is done continental style, involving groups of hunters, a 40-foot-high tower, and a series of hunting blinds hidden among the bluestem grass, sage brush and scrub palmettos growing in the dappled shade of a mature piney woods forest. “Between October and March, we set up one or two pheasant hunts each month for Sea Island guests and a few more for Broadfield club members and private groups,” Barber says. Pheasants aren’t raised on the property but are brought by a Georgia supplier before scheduled shoots. Hunting guides move 220 birds to the top of the tower, and up to 22 guests assemble in 11 scattered blinds. Guides release pheasants a few at a time from the tower. The birds either fly higher or swoop lower, their erratic movements creating a challenge for shooters. Guides and retriever dogs gather the felled pheasants, some of which are then field dressed for participants who want to cook them at home, and a few, upon request, are sent to taxidermists for mounting as trophies. Pheasants that get away join the resident quail population, living among the pines until being hunted later along with the quail. Pheasant, which tastes similar to quail, is occasionally served at Colt & Alison at The Lodge and at the Forbes Five-Star Georgian Room at The Cloister. There are two ways to taste ring-necked pheasant. One is to go on a successful hunt, take your catch home and cook it yourself, using fellow hunters’ hints or online recipes. Frying is the most common technique, though some prefer roasting, broiling or smoking. The challenge is to keep the small amount of meat on game birds (perhaps 4 ounces apiece in the breast) from getting dry and tough. The other way is to make reservations at a restaurant whose chef knows just how to prepare them. At Sea Island, one person with this expertise is chef Daniel Zeal. Two restaurants that occasionally serve pheasant are Colt & Alison at The Lodge and the Forbes Five-Star Georgian Room at The Cloister. 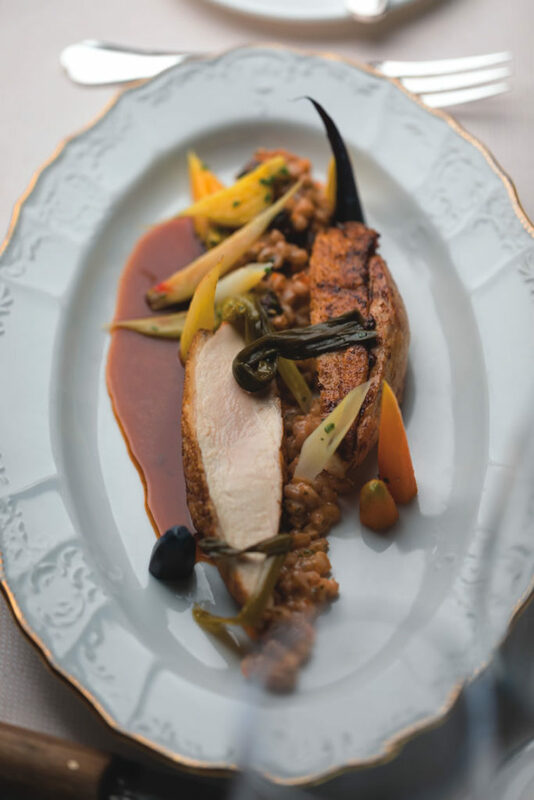 “I’ve worked at Sea Island for 12 years, and pheasant has always been featured at some point during fall or winter or even in spring,” says Zeal, the award-winning executive chef at The Lodge, who says he appreciates the resort’s long history with pheasant hunting. Techniques for preparing pheasant at Sea Island change, but the current method involves a long, slow brining process. The goal is slightly crispy skin and tender inside meat cooked medium-rare and still moist. Sides to complement pheasant include dishes like dried cherries and toasted pecans or pine nuts with a risotto made from farro, an ancient grain similar to barley. A light Italian pinot noir, soft on the palate without a lot of tannins, pairs well with pheasant, Zeal says. People new to eating pheasant often ask what it tastes like. One answer is, it’s similar to quail. If that doesn’t ring a bell, Zeal takes a like-chicken approach, even though it’s very different. “Pheasant is full-flavored and slightly gamey, even when farm-raised,” he says. “Think of it this way: If you like chicken thighs, the darker, stronger-tasting meat, you’ll probably like pheasant, but if you like the lighter white meat of chicken breasts, pheasant might seem strong to you.” Either way, it might be time to give it a try. People find many ways to use ring-necked pheasant feathers as works of art. Some stand the long tail feathers in flower vases or arrange them in shadow-box frames as decorative conversation pieces. They cover Christmas ornaments, highlight dream-catchers and calligraphy pens, and accessorize costumes and carnival masks with them. There are even silent versions of wind chimes made from pheasant feathers that dance in a breeze. Perhaps the most widespread use, by the most emphatic fans of the material, is fly-fishers fashioning tied flies. These anglers find every type of pheasant feather useful for mimicking insects that fish will mistake for the real thing. Feathers of various sizes, textures, colors and patterns, drawn from tails, wings, hackles, shoulders, cheeks and heads, can be creatively arranged to resemble mayflies, crickets, beetles, gnats, aphids and other fish-attracting insects. The iridescent feathers from pheasants’ heads and necks, especially, are in big demand for tied flies. From observing to hunting, and dining to art, pheasants will likely continue to captivate their American audience for decades to come. • Ancient lore holds pheasants in high regard. Those flaming red facial feathers led some in China to link them to the legendary phoenix rising from ashes, and in Japan they were once considered divine messengers sent by a sun goddess. • A Burmese legend about a hunter finding an emerald inside one earned pheasants a reputation as symbols of good fortune. • Native Americans came to view pheasants as protective spirits due to their skill at hunkering down in tall grass, safely concealed. • Pheasants can run up to 10 mph and fly up to 45 mph, but only for short distances as they try to escape from predators. • Besides humans, predators that prey on pheasants include foxes, coyotes, hawks and owls, while raccoons and skunks feast on pheasant eggs. • If you see a pheasant breathing rapidly on a hot summer day, it’s because that’s how pheasants avoid overheating, similar to a dog’s panting. • Hens typically lay broods of about 12 olive-brown eggs, which hatch after 23 days. Hens then remain until their chicks learn to fly, usually within two weeks. • Pheasants in the wild can live up to three years.